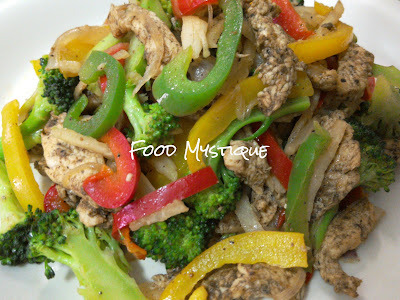 Food Mystique : Cumin Chicken with Mixed Vegetables - fragrant, full of beneficial and nutritional goodness . Cumin Chicken with Mixed Vegetables - fragrant, full of beneficial and nutritional goodness . There are two methods to making this healthy and tasty dish. I don't mind raw bell peppers but given a choice, I prefer them cooked. If you are also in the same category as me, then follow the recipe as below. 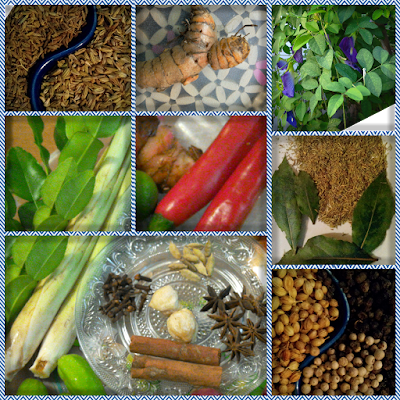 However, if you prefer eating raw, there is another method to this dish. Follow the steps in cooking the meat but dish out when cooked and pour into raw vegetables to mix together with extra virgin olive oil. There, that's your Chicken and raw Salad. Slice chicken fillet across the grain into thin strips and mix together with cumin and pepper. Set aside. Mince the garlic and slice onion thinly. 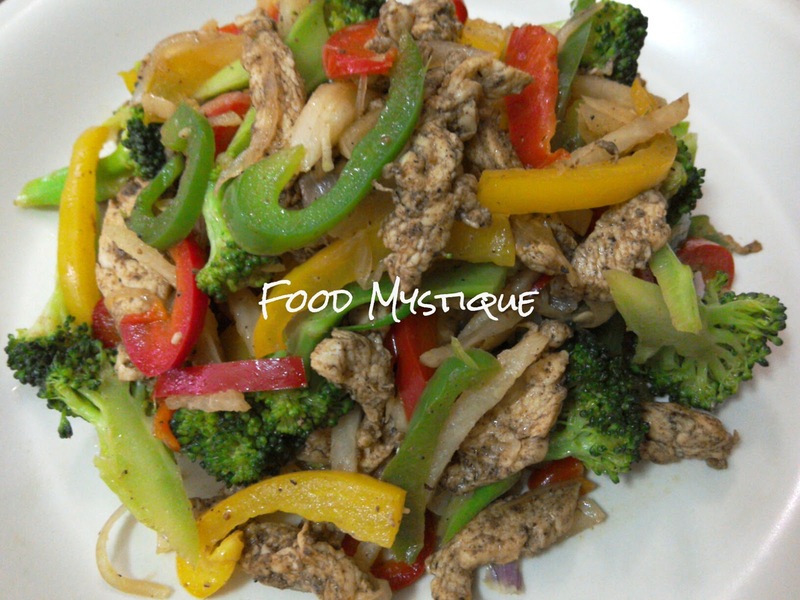 Slice bell peppers, broccoli and jicama into thin strips. Saute garlic and onion in heated light olive oil until fragrant and lightly browned over medium high heat. Add marinated chicken, sprinkle salt over and saute until meat changes colour and is aromatic. Mix in vegetables and stir fry until cooked but still crunchy. Turn off heat, mix in extra virgin olive oil and dish out to serve with bread, baked sweet potato/pumpkin or as a side dish to rice. Can even be eaten on its own if on a slimming diet.